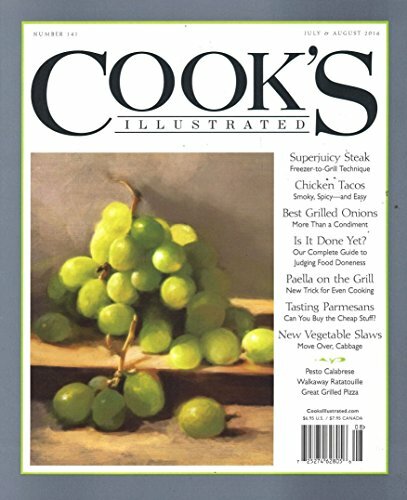 Cook's Illustrated magazine brings step-by-step cooking instruction into your home kitchen. Aimed at beginners with a desire to create eye-catching, mouth-watering creations, this magazine gets you started in the kitchen right away. Plus, it's written in a down-to-earth style that makes home cooks comfortable whether they are learning something basic or tackling something more complicated. If you are a home cook who wants to learn expert techniques without spending a fortune on cooking school, Cook's Illustrated magazine shows you in pictures and words exactly how to create delectable dishes from scratch. It includes creative recipes, which are all tested in the magazine's test kitchen before being published, as well as detailed instructions on how to perform standard kitchen techniques, such as braising meat, slicing vegetables, creating garnishes, and carving meat. Reader tips, cookbook reviews, and reviews of new kitchen gadgets round out the content, making each issue worthy of a place in your archival collection of cookbooks and magazines. You'll never need to worry about hard-to-find or pricey ingredients in Cook's Illustrated magazine because each recipe offers commonplace substitutes. Because educating readers is a major goal of the publication, you'll also learn a bit about the history of specific recipes and start to understand why certain techniques are used instead of others during the cooking process. No matter your level of culinary knowledge, there's always something more to learn. Get up to speed on kitchen techniques and start to feel comfortable in the kitchen with Cook's Illustrated magazine.